We are still looking for sponsors and those willing to help. We hope to have television news coverage, print media and web in which our sponsors will be showcased. Please contact us with any questions. 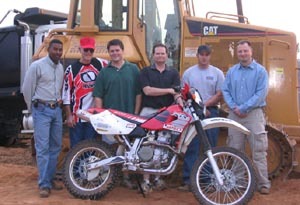 We are a team of east coast riders from North Carolina who are going to compete for the first time in the Baja 1000. While desert racing will be a new experience for all of us, most of us have ridden motorcycles our whole lives. 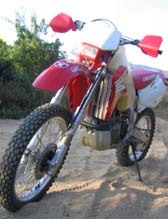 All of us compete in hare scramble races in our region. Some of us have motocross backgrounds and some of us have road racing experience. Todd Bennick, owner and operator of Bennick Grading, has stepped up to finance a major portion of our racing expenses, in addition to the many others who have contributed (please check our sponsors page to see these and be sure to use them when you can since they support our sport). Todd Bennick is no stranger to racing. In the early 90's he was a top 10 rider in the Supercross East Series. He now races selected events, but spends most of his time sharing his faith through an MX Freestyle Exhibition. When not riding, Todd is busy running and operating Bennick Grading. 828.442.2273, which offers shoreline stabilization by barge for Lake James Marine Construction. Read more at http://www.bennickgrading.com. Baja 1000 is the longest (1000 miles, or over 1600 km) and, according to some, also the hardest off road race ever. It takes place on Mexico's Baja California Peninsula during a full moon to aid the racers. The competition was officially started in 1967 (it had previously been the site of informal dirt bike racing), and originally went from Tijuana, Baja California, to La Paz, Baja California Sur. Now it starts from Ensenada, some 40 km to the south. It is usually held the weekend before the Thanksgiving holiday is celebrated in the United States. Home | News | Sponsors | Contact Web design by Marc Hyatt at www.spiderwrite.com © 2005 All rights reserved.